Let’s address the obvious, first. What on EARTH is a wurly? Let’s ask Wictionary. An Australian indigenous shelter made from small branches with leaves still attached. Phew, I’m glad that’s out of the way. Now, before we get all shirty about the use of jargon in interpretive panels, we should look at the possibility that this was a conscious choice. 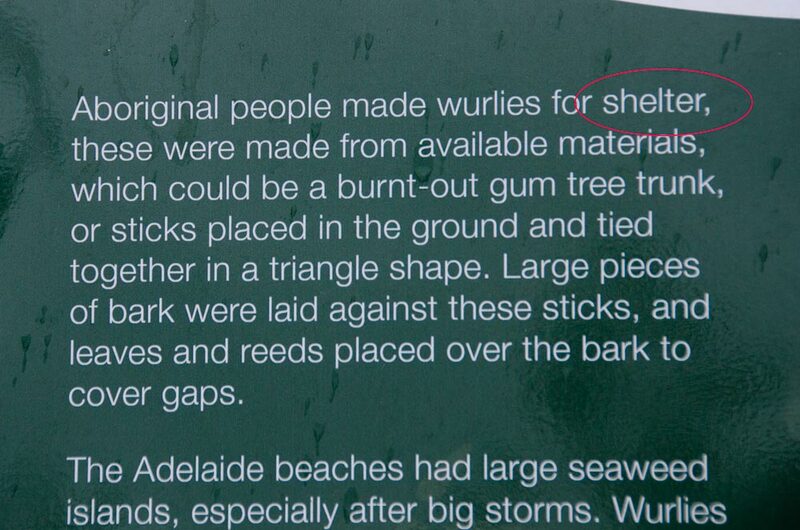 Perhaps the writer or interpretive planners looked at their goals, studied their markets, and concluded that their target audiences could be expected to know what a wurly was. And to be fair, the panel was located along a municipal pathway where the bulk of the clientele might be local. Wurlies aside, the real shame with this panel is the egregious misuse of the comma. Never, ever use a comma to separate two independent clauses. It’s acceptable in French, and in other languages for all I know, but never acceptable in English. Why do we keep making this mistake? And why did nobody catch it before it went to fabrication? When writing for interpretive media, always have your work vetted by a) a professional editor; b) a subject matter expert and c) a member of your target audience. Posted in Interpretive Media, Oops! and tagged interpretation, panels, signs.